Several holes were drilled by our team of (7) individuals. 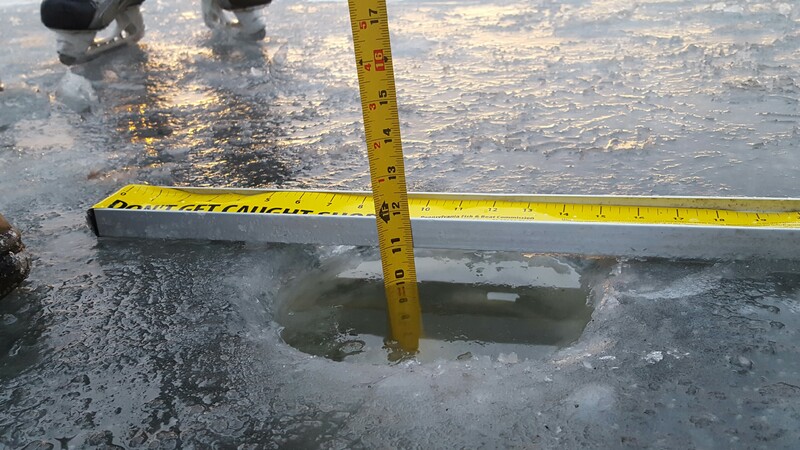 All of us had to cross a threshold of 1-2 inch thick ice on the immediate shoreline(very shallow). The first 6 to 8 feet is thin due to recent rains, but has already froze up and formed a pressure tent. We don’t advise anyone doing the same for another few days, or unless you have a ramp or dock spanning the thin ice to get out to the noticeably thicker ice pack. We skated between both planned venues(Boat House is North; Silver Birches is South) and timed ourselves at 10 minutes each direction while taking time for Photos. We observed a lot of small rocks and debris thrown out on the ice by kids and uniformed people on those dangers as well. Rocks and sticks cause problems for skaters and snowmobiles, so please refrain from throwing rocks out on the ice to test thickness or hear strange sounds. There is no sound produced from thick ice. Also, we found trash out there… if you are going to grill with charcoal, wait till it cools and pack it out with you. Please leave the lake undisturbed. We do plan to resurface the ice using water pumps. However, we still need to start with a level surface and no tracks of any kid. With the snow that is now falling, we hope that ATV’s and snowmobiles can avoid these areas directly in front of the Boat House and Silver Birches resort. Some Safety barriers with flashing lights will be placed at these locations to reserve space for easier facilitation of making smooth skateable ice.